Jax's daycare closing in 3 weeks. Need to find a fulltime placement asap! Looking for full time, state licensed care beginning May 31.
is for a 3 year old, so somewhere with a preschool program would be particularly good. Ballston Spa/Saratoga. Anyone have ideas for Bliss? Let's open to this good daycare/preschool programs in the wider Capital Region, too. Share, please! Saratoga Independent School on Rte. 29 towards Schuylerville takes 3 year olds and I've heard lots of great things about it. We're considering putting our daughter there when she turns 3. You can also check out the Capital District Child Care Council for recommendations and licensed programs. Saratoga Springs is really tough and unfortunately it's not a great daycare scene here. Consider North Country and the one at the Lutheran Church on Lake Ave - but these are traditional daycares and are not for everyone. Waldorf and Saratoga Independent doesn't have full time care for 3 year olds, but Independent school might start that in the fall. If so, I know about 20 mothers at North Country who will split and head there. If you need a secure place which is off the beaten path but in Saratoga, you could consider Apple Blossom on Grand Avenue. We're moving our daughter to Saratoga Independent if they open up to full time in the fall. We can't handle the decline in care at the other daycares. Thank you all for your helpful comments and suggestions! NLM: My son has been going to Apple Blossom, and it's been really quite lovely, but unfortunately we have to find someplace else. Emily: Everett Road is really out of the way for us, but hopefully that will come in handy for someone else who might be reading this. I'll check out the CDCCC website. Sara: Very handy link - thank you! AddiesDad: That's a little out of our way but we'll take a look at it. Thank you! It's worth noting that the NYS OCFS has a searchable database of licensed providers, lots of good information there. We are in the exact same position. Thanks Cornerstone. We're looking for infant care for our 5 month old. The annoying part is that most of these day care replacements don't have openings (if at all) until September. I wish these people would stay open thru the summer.... Feels like there is nothing we can do, but is there? I should also mention that we are looking for a replacement somewhere in Guilderland ish area close to where my wife works... Or somewhere not too far from there, going to check a Delmar spot this week, and other Colonie spots next week. Urgh! We went through the same thing a year ago when our daycare closed. We're at the Albany JCC now and it is really fantastic. I'm very happy with it, my daughter loves it, and they offer alot of extras for the kids. I especially like the swimming in the summer - my daughter has excelled at it since starting last year. 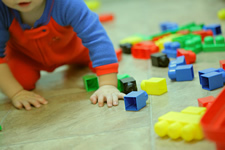 There are current infant openings at our daycare center The Children's Place at the Plaza. We love this center. It's in downtown Albany, so not at all where you are looking, but infant care is hard to find. 473-7112. If you're looking for something to get you through the summer, there is a glut of college students looking for summer work right now. We just ran a Craigslist ad and in 24 hours had more than 20 decent responses, we interviewed our favorite three and had someone incredibly wonderful (caring, experienced, etc) lined up to start the following week. i'm in the same boat. st peters might have openings by sept. they will find out this week if any wait-listed families decline. karen from cornerstone recommended corporate woods childcare 436-5821. traffic might be tough. i'm checking them out tomorrow. they do have infant spots available now. i was devastated, bb was to start there monday and now i'm scrambling. I know this won't necessarily help people from the Saratoga area or those that are looking for infant care, but for preschool I can suggest The Albany Academies. Their preschool program is co-ed, accepts 3 year olds, includes lunch, and offers extra activities like swimming and ice skating instruction, art, creative movement, etc. At least one person I know found prices to be competitive with full day childcare in Guilderland. Full disclosure: I work there, but not in the preschool. I work with much older kids. My 2 1/2 year old daughter goes to Mapleleaf in Malta, we like it there, and it's in the Ballston Spa school district. Trinity Day Care 215 Lancaster St.
For those who are reading this page years after the original question was asked: It's only part-time (half day), but St. Vincent's Preschool in Albany is a really wonderful place -- we visited so many preschools and are thrilled that we found it. We are not Catholic -- definitely welcoming toward families of all religious backgrounds. The website is http://www.stvincentspreschool.com .